Ooooohhhhhh, well that makes sense, huh? audiodane wrote: Whoa!!!! I was totally unaware of this until just checking the forums here today.. this is so cool! I understand cautious optimism and all, but I'm certainly excited. And I forget who said it (I didnt' hit "quote"), but yes, I suspect this forum will begin getting more traffic again soon..
Can I ask where the tag comes from? just curious.. from one ..dane to another! The "Location: Land of Hamlet" kinda gives it away. adeyke wrote: The difference is the Mario and Mickey Mouse were actively used as mascots for their respective brands for many years (up until the present). Mario has appeared in around 200 games. If you watched children's entertainment or played Nintendo games, it's basically inevitable that you'd become familiar with Mickey Mouse or Mario, respectively. King Graham isn't like that. 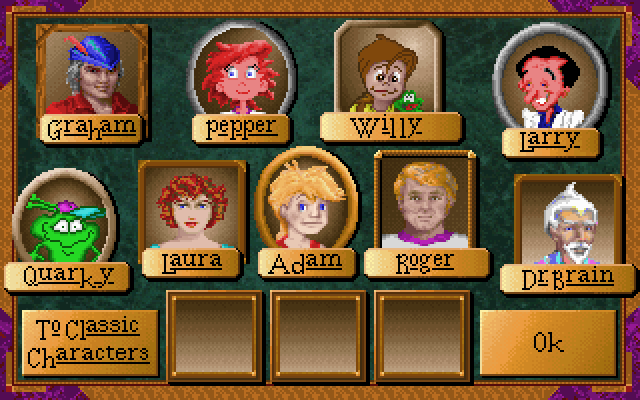 Almost all exposure to Graham would come from playing his three games (or in the Crazy Nick's game, which is something only someone invested in the King's Quest franchise would see). He did have some other appearances (as easter eggs or in the Hoyle games), but there he was treated as just one Sierra character among many. Graham's claim to fame is mainly a historical one. KQ1 is a significant game, and Graham starred in it. He just doesn't have any ongoing cultural relevance. It's like if Nintendo had stopped after Super Mario Bros. and had Disney had stopped after Steamboat Willie. Reminds me, I loved to play cards with Graham, Laura and Roger. Collector wrote: The "Location: Land of Hamlet" kinda gives it away. I never claimed to be the sharpest tool in the shed..
My only exposure to King's Quest comes from my Grandpa, who is a big fan of the series. I've played 1-5, which means I haven't played 3 of the non-Graham games. With that said, I would still agree that Graham is the most significant character of the series. With regards to its relevance to modern gamers, I'll point out that I know 5 or 6 "geeky" kids about my age, 15-17, who knew what King's Quest V was before I had ever mentioned it. I think this is largely due to the number of youtube videos of the game. Anyway, I just wanted to point out that younger gamers have at least some idea of what King's Quest is, so it should be familiar to them.